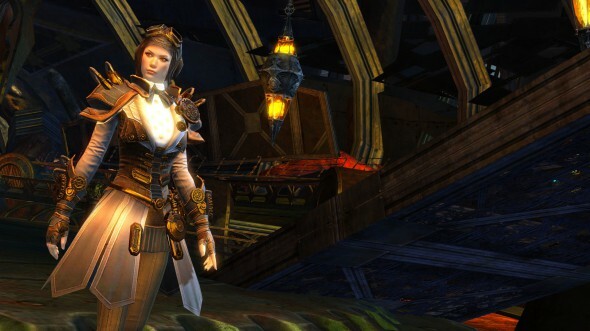 GW2: Who Are the Aetherblades? 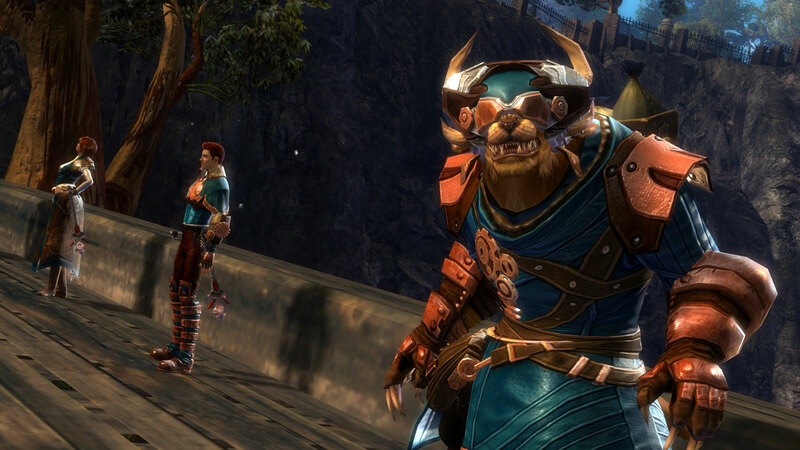 ArenaNet offers an interesting behind the scenes look into how they came up with the new Aetherblades pirate clan. They talk about initial concepts, costume/armor design, mob types and attack abilities, and some ways they can interact with current game lore. Hey everyone, game designer Steve Hwang here with some background how we put together the Aetherblades, our Sky Pirates of Tyira, for the upcoming release. Not much is currently known about the Aetherblades, as they have only recently appeared in Lion’s Arch. The Dragon Bash was in full swing in Lion’s Arch, with citizens gleefully bashing dragon piñatas, eating Zhaitaffy, and shooting fireworks. Everyone was enjoying the festival – until tragedy struck at the effigy lighting ceremony. After tampering with an effigy to make it emit an arcane pulse, the Aetherblades descended from the sky with Inquest golems to ambush the council and kill one of its members. If not for the bravery of heroes who aided the Lionguard, many more council members would’ve been lost. But be wary: the Aetherblades have just begun to permeate Tyria. When the June Living World team formed, we needed to create a new alliance of pirates and the asuran Inquest which would crash the Dragon Bash party in Lion’s Arch and trigger a chain of events that would forever change the Ship’s Council. I jokingly called this new alliance the “Pin-Quest” until the team found their true name. We use a lot of internal names at ArenaNet to help us wrap our heads around what a certain faction is, what they look like, and what skills they would use. Similarly, “Fledge” was the temporary name for the Flame Legion and Dredge before we named them the Molten Alliance. Now, Tyria is no stranger to pirates. There are several established pirate factions in Guild Wars 2already, such as Covington’s Pirates in Bloodtide Coast or the triple threat of Slade, Jackdaw, and Wiley’s pirate crews in Gendarran Fields. Given that many players have already fought pirates, how could create a distinctive look and feel for our new buccaneers? First, we needed to establish a unique pirate aesthetic. We based the Aetherblades on a steampunk-style armor set that was in development. Next, all proper pirates have ships: Long John Silver, Jack Sparrow, Captain Harlock… and so should our new pirate clan. However, instead of being traditional water-based scoundrels, the Aetherblades come from the skies – which of course meant providing them with an appropriate mode of travel. We figured our sky pirates, being felonious by nature, would steal their rides from the Pact, who have their own fleet of airships. But the sky pirates needed to really feel different; not just in how they look, but in how they played. They were allied with the Inquest, the unscrupulous asuran organization whose research knows no moral limits. Their asuran alchemy could certainly lend itself to the steampunk vibe of the sky pirates. 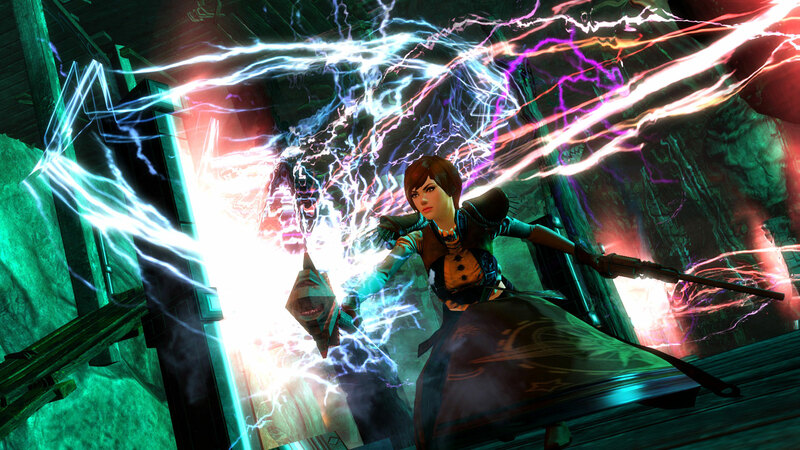 In this case, we imbued the Aetherblades a lightning aesthetic: they arrive in a bolt of lightning, and their skill effects, traps and, weapons are all laced with electrical effects. Lastly, we needed a solid name to convey that both pirates and Inquest were working together. We kept coming back to one name that our writer, John Ryan, had proposed: the Aetherblades. The word “aether” has air and magic connotations, and “blades” helps convey the swashbuckling side of pirates. Short names are nice, being simpler to remember, and it gives players an easily recognizable prefix to the enemy variations, such as Aetherblade Strikers, Aetherblade Thugs, and Aetherblade Swashbucklers. We have a very iterative and collaborative development process for all our Living World releases. The earlier we can get content into the game in a playable form, the more time we can get feedback from co-workers and alpha testers and then revise it. Even before the steampunk armor set was added to the game and before the story dungeon map was laid out, designer Elijah Miller had created a test map where we could fight the Aetherblades, try out their different skills, tweak their effects and timing, and establish an initial difficulty tuning. * Aetherblade Thug: This slow-moving power hitter can immobilize and knock down his opponents. 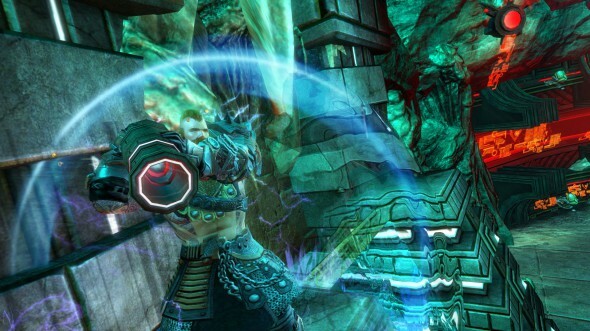 * Aetherblade Thumper: This hearty pirate has a three-hit combo and a protective shield. * Aetherblade Swashbuckler: This pirate deals bleeding and crippling, and throws daggers to opponents beyond the reach of her rapier. * Aetherblade Taskmaster: What these brutes lack in speed they make up for in applying conditions. * Aetherblade Striker: This caster can channel a lightning attack and a dazing aura. * Aetherblade Grenadier: Like the name implies, this scoundrels throw grenades that pack a wallop. Those of you who venture into the Aetherblade Retreat story dungeon will find a few new bosses with their own challenging mechanics. Parties will come across an asuran engineer with rotating electrical walls, a first mate who shoulders a ship’s cannon and rains cannonballs, and lastly a captain who’s deft with the rapier and is a shockingly good shot. I don’t want to spoil too much, so you should definitely discover them for yourselves. Inspector Kiel’s going to need your skill and your resolve to put a stop to the Aetherblade menace. So step up, fight for Lion’s Arch, and show the Aetherblades they can run, but they can’t hide. We’ll see you in-game!